Ten thousand Jews fought in the Civil War; 7,000 for the North, 3,000 for the South. 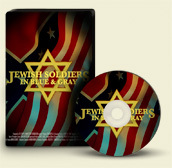 Although largely ignored in the traditional historiography of the period, “Jewish Soldiers in Blue and Gray,“ a deftly produced, visually compelling DVD from Indigo Films, capably fills void. Using the Ken Burns-like approach to documentary film making (expert talking heads interspersed with period graphics and contemporary video), the DVD is chock-full of interesting facts and compelling anecdotes about how Jews reacted to the coming of the war and the exploits of individuals on the battlefield and the home front. Profiles include Judah P. Benjamin, a lawyer and pre-war senator from Louisiana, who was the second most-powerful official in the Confederate government, serving as Secretary of War and later as Secretary of State. Abraham C. Myers served as the Confederacy’s Quartermaster General and Moses Ezekiel, the first Jewish cadet at the Virginia Military Academy, fought with his classmates at the battle of New Market in June 1864. Union Brigadier General Frederick Knefler was the highest ranking Jewish officer in the Civil War; Captain Isaac Moses was the war’s first aerial battle observer, reporting on Confederate positions at Williamsburg, VA in 1862; and Sergeant Leopold Karpeles of the 57th Massachusetts was one of five Jews to receive the Medal of Honor. The video also describes what it calls the most blatant anti-Semitic act in American history, Ulysses S. Grant’s infamous General Order 11 of December 1862 that ordered all Jews to leave the territory under his command within 24 hours. The order caused a furor throughout the North and, under pressure from Jewish leaders, President Lincoln ordered it rescinded. Screenwriter and director John Milius, whose Jewish ancestors rode with rebel partisan rangers in Missouri, provides a clear narrative voice to move the action along and actor Sam Waterston confidently voices the words of President Abraham Lincoln. In the early days of television, actor Todd Andrews portrayed the Confederacy’s most successful mounted partisan ranger, John Singleton Mosby in muted shades of black and white. Now, six enthusiastic Mosby historians from Northern Virginia revive the exploits of this colorful cavalier by visiting 42 locations where he jousted with perennially frustrated Union horsemen. While “Mosby’s Combat Operations in Fairfax County, Virginia” lacks some of the production values of professional video company, the historical expertise of the producers overcomes many unavoidable liabilities such as often shooting in locations that long ago succumbed to suburban sprawl. Eric Buckland, Tom Evans, Don Hankerson, Charles Mauro, Stevan Meserve, and Mayo Stuntz also make effective use of period illustrations and each provides insightful on-camera commentary. A handsome map accompanying the DVD will allow modern day battlefield trampers to revisit the sites of Mosby’s exploits, now armed with the cogent commentary provided by this informative documentary.